I've just ordered a toner for my Lexmark T630 printer. After I completed the order I noticed that it's a compatible Lexmark T630 high capacity black label toner. Is this suitable for printing A4 documents and letters etc or is it just for printing labels? If it is the latter, I will need to cancel the order. The compatible HP T630 toner cartridges we sell have the technology to do label printing but they can also be used for printing everyday documents and normal office use. They are not limited to label printing. If your Lexmark printer is running out of toner then you could make fabulous cost savings as a result of ordering any of your new Lexmark T630 toner provider. Considering our competitive deals and also our lowest price promise, you'll be confident of receiving the best deal on your Lexmark T630 toners. Our business intend to meet the needs of every single buyer by giving affordable costs as well as high quality Lexmark T630 toner which operate correctly every single time. If perhaps you have previously ordered Lexmark toners from Cartridge Save in the past then you will already know that our speedy delivery will reduce your costs. Start to save right now when you get bargain-priced Lexmark T630 toners whenever you use Cartridge Save's online store. Meanwhile, you can order a cheap Lexmark T630 toner cartridge just by phoning our orders line directly when it best suits you. Customer happiness is Cartridge Save's top priority so we give shoppers a full money back guarantee for Lexmark T630 toner cartridges to offer absolute peace of mind. To find the ultimate deal on Lexmark T630 printer cartridges you just can't beat purchasing with Cartridge Save. The Lexmark T630 is one of the top-performing printers with blazing speeds that reach up to 35 pages per minute for black and white prints. This laser monochrome printer can be set up for a single computer and produces documents in a sharp resolution of 1,200 x 1,200 dpi. Additionally, a 300 MHz processor is mated with 32 MB of memory to offer excellent print job management. This printer is designed in a modern white enclosure that has dimensions of 42.16 cm in width, 49.78 cm in depth, and a height of 34.54 cm. Weighing in at 17.01 kg, the Lexmark T630 is neither the lightest nor is it the heaviest printer on the market. A USB cable or a parallel connection are the only available options for connectivity. This printer also has a media capacity of 350 sheets and an output capacity of 250 sheets. In addition, Lexmark T630 toner is fabricated to have a cycle life of up to an incredible 21,000 pages for high-yield cartridges. An advantage that this printer offers is a memory expansion slot that will accept an upgrade of up to 288 MB of RAM for improved performance. To improve graphics, the Lexmark T630 puts 1200 IQ technology to work which helps enhance images and replicate colours accurately. 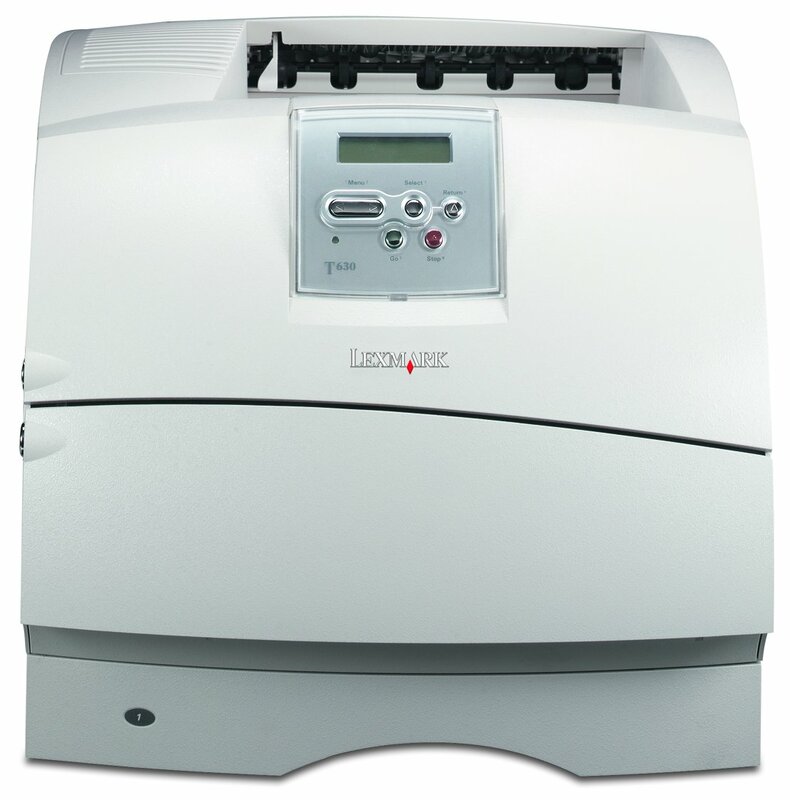 The Lexmark T630 toner printer has no difficulties passing stringent EPA tests and is qualified as being energy efficient. Using this printer will only draw 580 watts of energy during operation and 14 watts during standby. It can also support duplex printing, which is a great benefit for anyone trying to reduce paper costs. For the speed in which it prints, the Lexmark T630 is competitively priced and is one of the better deals that are available for printers that produce over 30 pages per minute. The biggest drawback to the Lexmark T630 is its lack of networking hardware. This printer will not allow for networked computers to use it as a print station. Another minor disadvantage is the Lexmark T630 is a single-function printer that does not incorporate a scanner, copier, or fax machine.